I was so sad to see this. I had to stop on my way to work to get pictures. From what I can tell, it happened yesterday. The building was recently cited as unsafe and needing to be torn down or restored. Noticed this today! Had family members with me or I would've pulled off the interstate to get pics as well. Very sad. Just a few months ago I explored inside this NF and documented it. Sounds like I was one of the last to do so while it was still somewhat intact. There are a few across the USA that are still in use but this is the only one I have seen with the NF sign still up. I take it that it never released . So sad. The building was finally leveled last week. Not sure if a demolition crew came in or if it just collapsed by itself. There's no evidence of a demolition crew, and the rubble is still on the ground. It is really sad that these restaurants were not able to survive. The one in Fowlerville, Michigan is still operating as Fowlerville Farms. I went there last week while on vacation. It was like taking a step back in time. 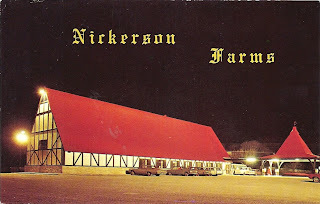 Though the restaurant has a new name it still upholds the Nickerson Farms tradition. They serve homemade loaves of bread with your dinner and still slice the bread and grill it for toast in the morning. The interior of the restaurant has been updated but still has a number of the iconic features of the original Nickerson Farms restaurant. For the first time, I have seen a Nickerson's that isn't only beautifully preserved, but has been repurposed: http://www.redmonscandy.com/ Phillipsburg, MO. I was wondering if anyone has any information on the Nickerson farms just off at Methodist Road near Hinton Oklahoma . When was it opened and what year it closed down? Thanks! I have always wanted to reopen one. Went by this several times and was surprised to see that it was gone. I worked first as a manager trainee in the Sweet Springs Store then was transferred to the store in Tonkawa (Blackwell) Oklahoma. I only lasted for about 6 months.